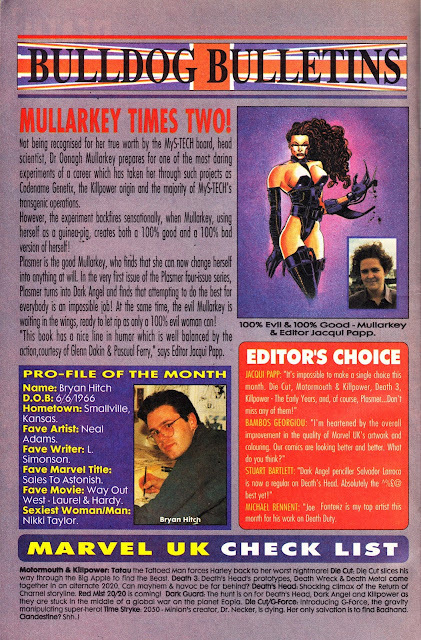 BULLDOG BULLETINS was a late-entry Bullpen Bulletins style page of behind-the-scenes and hype that appeared in the US GENESIS '92 books just before the Marvel UK line imploded. It's notable for plugging several current or upcoming titles that were overtaken by events and never appeared. Amongst those AWOL: MOTORMOUTH & KILLPOWER: TATAU (which was probably the same as the second volume of Motormouth & Killpower announced elsewhere and solicited in MARVEL AGE MAGAZINE 129), RED MIST 20/20 (a crossover event that would have appeared in 'ROIDRAGE, DEATH DUTY and BLOODRUSH... except they were all cancelled at the last minute) and TIME STRYKE (of which I know nothing). CLANDESTINE - Marvel UK's great hope - did eventually appear... albeit from the New York office. I assume Bryan Hitch's profile piece was compiled entirely in jest. This appeared in US format M-UK comics cover-dated November 1993. See here and here for more on the US-format line... including several abandoned books.